With this month dedicated to women and Spring slowly approaching soon, take inspiration from blooming flowers. This time we see luscious blooms so realistic, you can’t believe they are not growing out of a dark and mysterious garden rather than from wallpaper’s flat surface.Brazen, bold and beautiful, there is an undeniable allure to the bloom-festooned Dark Floral wallpaper. Decorating with bold wallpaper like this is not only beautiful, but has powerful symbols that express the full range of human experience, that any woman or man would love. Pairing the papers with minimalist, clean-lined furniture contrasts well with the weighty, lush flowers. 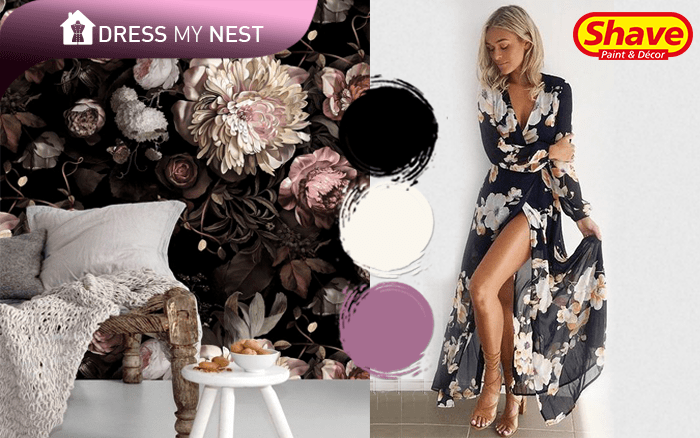 Adding in some mixed pastel shades like blush pinks and green in textured furnishings will help add light against the dark wallpaperFor all things bold and beautiful, a floral wallpaper that every woman will love. We can recommend the following paint colours to create this look: Parisian Pink (FQ-8), Polo Stick (CC-1) and India Ink from Shave’s Colour Collection II.